TheSabre.com is proud to feature a partnership with “Hoos Talking”, a sportstalk show geared directly to you, Cavalier fans. “Hoos Talking” airs on Fox Sports 910 in Richmond. Your phone calls are always welcome at (804)-345-0910. Hosted by Jim “Hobbo” Hobgood and diehard wahoo Frank Maloney, the show airs on Monday nights during the collegiate sports season from 6 to 7 p.m.! The show features expert analysis as well as featured guests from around the world of Virginia athletics. Sabre Editor Kris Wright and Sabre Recruiting Analyst Chris Horne often appear as guests on the show. Sports experts, coaches and former UVA stars appear as guests on the show. The show’s hosts are Wahoos through and through. Jim Hobgood was the analyst for Virginia men’s basketball on the Virginia Radio Network for 12 years. A former UVA basketball standout, Hobgood was a three-year Cavalier letter winner from 1971-73. Hobgood joined Barry Parkhill as co-captain of the 1972-73 squad and was named a second team Academic All-American following his senior season. He was the second-leading scorer on the “Amazing Cavaliers” of 1971-72, averaging 12.2 points per game as starting forward. Virginia posted a 21-7 record that season and advanced to postseason play (NIT) for the second time in school history. Hobgood is a veteran in the financial services industry and has been a MDRT producer. He and his wife, Linda, have two adult children. 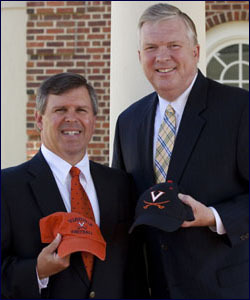 Frank Maloney graduated from UVA in 1982 and earned his Master in Sports Management degree from the University of Richmond in 1987. While at UVA he enjoyed playing intramural sports and competing for the local lacrosse club. In addition, in the past he has served on the local volunteer Board of the VAF, served as President of the Richmond Chapter of the UVA Alumni Association and served as President of the Bill Dudley Scholarship Foundation. Maloney has attended the majority of all home Virginia football and basketball competitions since the mid-sixties. Maloney is a senior business broker with Transworld Business Advisors in RVA. He advises and assists business owners wishing to sell their companies. In addition he advises potential buyers on purchasing businesses and franchises. He has an adult daughter that manages a successful business. Make sure to listen to this season’s audio segments from the show below. Looking for Seasons 1-9? Click here.